I haven´t written in this gardening journal for quite a while. I went “underground” pardon the pun, due to the death of a dear friend and the final push toward achieving a Master’s Degree – research, thesis writing, proofs and revisions that took me through the first few months of 2014. But being busy with academics helped to distract me from grieving, for when I need a therapeutic lift, I typically turn to gardening. Graduating at the end of May, I now had the time to devote more hours to a neglected garden. I found myself reflecting on the renewal powers of nature, and remembered my friend more poignantly than I had in the past year. I saw death recycle into blooms. I looked for signs that she was speaking to me in the emerging, bashful blossoms. 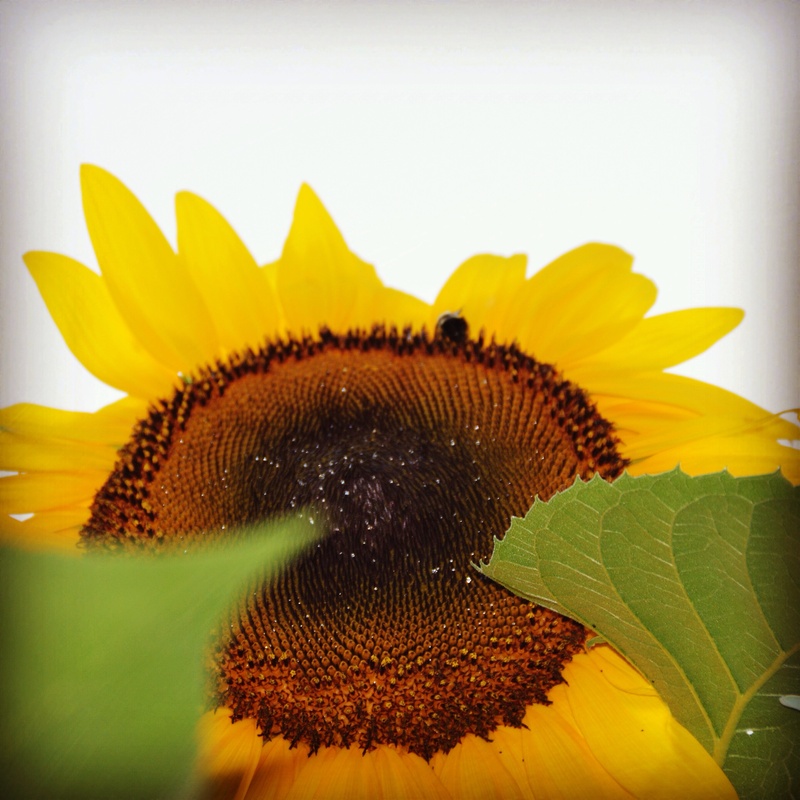 I planted a whole slew of sunflowers in her honor – her favorite flower. My friend was always incredibly thoughtful and sensitive, a person who never forgot an occasion with a card or a phone call. She sought out reasons to connect — a local festival here and there. She didn’t appreciate the alone time the way I did. Her sensitivity to all things was both a blessing and a curse, deeply embedded in her psyche from her parents, particularly by a father she felt had passed her over emotionally. My friend was easy to wound, easy to feel any hurt or slight. That fault, if you can call it that, was matched and exceeded by her capacity for kindness, and at times, an obsessive capacity for detail and attempted control of her surroundings. I suspect this was a reaction to her deep-seated pain. She knew what it felt like to suffer so she went out of her way to make the lives of others brighter. When news came out about Robin William’s suicide, my friend’s sudden death, now a year-old-memory, washed all over me once again. They both died the same way, the same month, one year apart. My friend was no comedienne, but as I read about William’s near-obsessive need to please people with comedic talents, the other quieter stories about him emerged as well and the similarities between the two became apparent. The private notes he sent people who he felt needed a lift, the gentle spirit that reached out in a quiet, almost whisper-like voice, to soothe. Robin Williams played a teacher/therapist many times, and those roles were his most profound because I think. his true essence emerged in those characters and resonated with his audience. And it was those descriptions of Robin Williams that I most recognized in my friend. They were talking about her too! My friend was a teacher—she taught preschool for many years—and if you know any preschool, kindergarten, or elementary school teachers, you will know what I mean when I say they have a unique way of talking—a melodic tone—balanced perfectly to attack childhood tears, scraped knees or reassure a young soul being bullied. Yes, Robin Williams and my friend shared a lot in common. From reports, Williams faced a canceled TV show, a career that slowed down (but surely only temporary) and a revelation that he was in the early stages of Parkinson’s Disease. These were the obvious catalysts to his suicide. My friend faced a divorce, and the possibility of losing her home, which was never much of a reality. But she thought so and I am sure it terrified her. And so with these real and imagined terrors looming and Lord knows what else, both chose to leave this world behind. They chose to leave us. Me. What the hell? Why they had everything to live for! This doesn’t make sense! No, it doesn’t. My reaction wasn’t unusual. And as you know, the stories about Robin Williams were everywhere! I am glad it has started a conversation. I always read the online comments in these stories, from the fans, the trolls, and the know-it-alls. The kind comments and hurtful ones too. People who think before they write and shoot their mouths off. When they said hurtful things about Robin, they were saying them about my friend too. And here’s the thing. We commentators, the audience, the friends, the family—we can be so shortsighted and so closed-minded! The human brain is an organ—like our hearts, kidneys, lungs, liver, stomach and so on. Think about a friend or relative who is ailing. Perhaps it is someone with low kidney function, cancer, childhood diabetes, leukemia or a heart conditions. When we learn about those illnesses, what do we do? We hold each other’s hands. We send get well cards. We post on each other’s Facebook timelines. We ask what meds are prescribed. On some level, we empathize. We become a cog in the support wheel. When some part of our physiology doesn’t work—we have this enormous capacity to be the most empathetic creatures. We send out thoughts and offer prayers. We visit in the hospital, we share and compare symptoms. There’s nothing wrong with advocating positive thinking, but most of us don’t expect a diseased organ to cure itself by sheer will. That would be ridiculous. Imagine telling someone to ignore those lungs, that weak heart, because life is good! We never expect a physical illness to reverse without some serious support systems in place. Our relationships, medical progress, technology and a higher power all weigh in to collectively cure or soothe. We know their journey is complicated, biological, medical, and perhaps genetic. We can conceptualize their disease or disorder. If they choose, the patient can talk freely about what is going on as we listen without judgment. We don’t fault them for getting sick because we know parts of the human machine can go bad. Our compassion is an important part of the therapy. We cheer them on as they pursue any remedy to ease pain. But when it comes to the brain, the organ that modulates our behavior and thinking process, there is a disconnect. Mental health treatment is still woefully limited. There is a stigma about mental illness, you see, so we don’t talk about it, not the way we do our other aches and pains. People suffering from a disorder of the mind —why, there is something “wrong with them” and it is behavior that makes them act funny and makes us feel uncomfortable. We can handle organ failure or physical limitations. But if a person’s behavior or personality is altered—most of us can’t comprehend or deal what is going on. Sadly, it is often viewed as a personal fault — a perceived weakness that, if only the patient were stronger, they could control and keep in check. Self-cure. “C’mon, look around you and all that you have to live for!” “There is no reason to feel this way.” Try telling that to your heart, liver, lungs, pancreas when they don’t work right. Yet, we say it to people whose brains aren’t working right. We have no idea how insensitive we sound! When I heard the news about my friend, my whole being exploded with every emotion imaginable. Guilt was high up on the list. If only I hadn’t been so busy. I thought about the family she left behind. I knew how deeply she loved her children, so her suicide didn’t make any sense— why would she leave them like this and leave that kind of scar —unload on them what might appear as the ultimate rejection. For years I watched her raise her children and admired her thoughtful parenting. Knowing her childhood was troubled, I often told her the only good that came out of her experience was that it made her such a great mom. She appreciated that. She wanted to be a different kind of parent and she succeeded in my view. So her suicide was so hard to accept on that level. Mental illness and depression are so insidious. It might appear, as in my friend’s case, that divorce was the reason or the catalyst, but people get divorced all the time and rebuild their lives—why was my friend different? I really don’t know, but she was. There were signs all throughout her life, a permeating uncertainty for which she sought relief and received years of treatment. I’ve seen other depressed people close up, temporary or chronic, and when people are in the bowels of depression, they do not see a way out. If a person is lucky, they will be surrounded by intuitive people and experts to see them through, but we can’t always live with an entourage and we can’t expect our family to always be physically close by. It was not her fault. It was not her fault. It was not her fault. I miss her. I miss her ungodly long phone calls to me (and I am sure her other friends got the same calls) where we would in the span of a midnight hour or two, laugh, cry, plot, scheme, react, reason and come to where we dared to assume we figured out whatever we started to try and solve in the first place. The peace and new-found confidence would last for a day or two, and then another crisis or insecurity would surface …not always on her side, mind you, she was a good listener too, and in fact, it is when I would need her the most—in those moments—is where she would always shine—always be there. She had, as I reflect, a fragile need to feel needed and be reassured of her value. Her need went beyond a normal craving and was difficult to satiate. She carried with her an unexplainable void that she was never able to fill. For those of us who knew her, she had everything, and then some. Our assumptions were off the mark. Her brain told her the void was there. Only she could feel it. Fix it. Stop it. All my sunflowers came to boom in August. Right around the anniversary of her suicide. They emerged at first, bashful, then grew bold and bright. A late summer storm toppled them askew.I was able to right them up with some twine and they went on to bloom. I got some small satisfaction from being able to fix her metaphorically. I see her face in the large discs—the yellow petals remind me of her straight, cornflower blonde hair— the bench she kept outside her porch had a sunflower carving and she always kept a sunflower or two, fake or real, inside her home. Yep, she was a sunflower! Before her services, I shared with her daughters that I saw their mother as this beautiful, yet fragile flower who struggled to emerge and show off her beauty and sense of style (admired by many), but the flower could not endure the inclement weather and changing seasons. My time with my friend’s beauty was fleeting. But I can talk about her and share the happy memories. I can replant so I can relive the beauty. My memories are the seeds. Each of us live in a world is full of creatures weak and strong, some stay with us longer than others—so it is up to us to appreciate them while they here with us, stake them up if needed, and continue to replant them every year so we do not forget what they mean to us and how they brighten our lives. I’ve chosen the sunflower to remember my friend. In my garden, she is tall and strong. I can visit her anytime. She is close by. She feeds the birds. She is light. She brings JOY to all who see her. And like my sensitive, modest caring friend, she is blushing! Not quite aware of her own magnificent strength and power.